Rigorous trials in different countries have shown the remarkable effects of using the VitaFeed Nutri supplement. Studies show that bees increase their pollen consumption by 50% when the percentage of protein in pollen drops from 30% to 20%. When protein content drops, bees turn to their own body reserves. This in turn reduces their lifespan, their brood-rearing capability and therefore the development of the colony. VitaFeed Nutri compensates for protein deficiencies. VitaFeed Nutri will be available in the UK this spring and will soon become available worldwide through Vita’s distributor network. 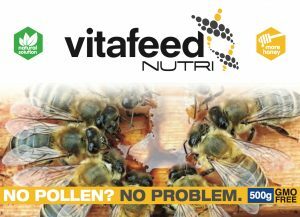 Vita’s honeybee health product range includes anti-varroa acaricides – Apistan® (outside the USA/Canada) and Apiguard® – chalkbrood and wax moth controls, foulbrood diagnostic kits and health-promoting feeds. Vita also supplies Asian hornet traps, Small Hive Beetle traps, the Bee Gym varroa grooming aid and swarm lures. Vita products have been registered by more than 60 veterinary authorities.